Twenty years ago, divorce rates were said to be as high as 50% in the US. While that number has been steadily dropping, divorce rates for people 50 and over has doubled in that time. In 1990, just 1 in 10 marriages were ending in divorce for people over 50; today it is 1 in 4. A study performed by sociologists at Bowling Green State University predicted the number of post 50 divorces could easily surpass 800,000 per year by 2030. Experts refer to this growing trend as The Gray Divorce. Why is this happening? How does this differ from younger couples experiencing divorce? 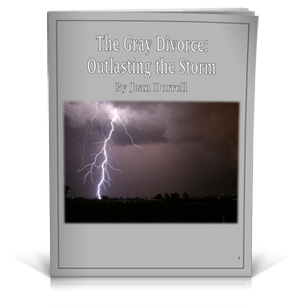 What can people experiencing The Gray Divorce do to navigate through this difficult time in their lives? Please fill in the fields below to download your copy of ‘The Gray Divorce’.